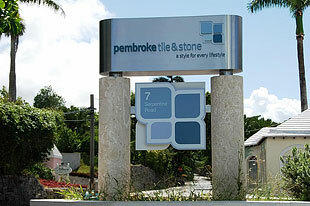 Pembroke Tile & Stone Co. Ltd. was established in 1989 by Bill and Carol Outerbridge. Having worked in the construction and building industry, they recognized a need for an exciting selection of quality tile and stone products for the design community. Using experience and contacts, they introduced Bermuda to products and concepts in tile and stone that were not previously available. After 25 years of business, that original focus remains important today. While the range of products is constantly evolving to offer new designs and materials, the company continues to offer the best quality and selection of tile and stone products available in the market today. The company’s current location at 7 Serpentine Road in Hamilton, Bermuda, opened in 2005 and features a bright and spacious 4,000 square foot showroom and 10,000 square feet of warehouse space. On display in the showroom are hundreds of different tiles from more than 30 suppliers. Visitors to our showroom can browse the tiles at their leisure and seek the advice and expertise of our client representatives. Still a family run business, Pembroke Tile & Stone Co. Ltd. provides the latest styles and products available in the industry in an inviting and inspiring setting. We are happy to work with you to get the design you want in your space. At Pembroke Tile & Stone Co. Ltd., we have a style for every lifestyle.